It’s a bold move to premiere your new show at London International Mime Festival, and one which young international ensemble Theatre Re only partly pull off. 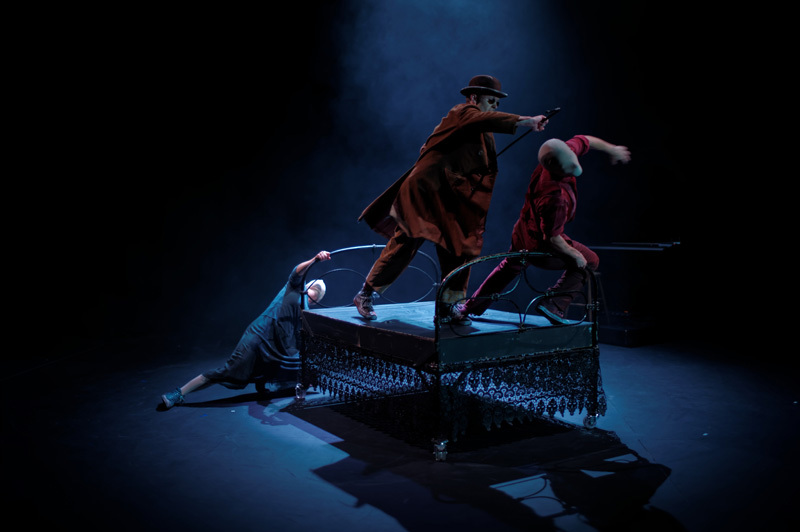 Not unlike Theatre Ad Infinitum’s Light, which plays elsewhere in the festival, the focus of their show is on darkness, or more specifically living in blindness, and their ideas about the space this condition might open up for absolute imaginative freedom. The opening image is arresting. A Beckettian, overcoated figure appears in the quiet of a blackout, his tiny black spectacles and stick identifying his condition. His gaunt frame reminds me of Mark Rylance in Endgame, a likeness that’s surely deliberate as the prevalence of battered top hats during the ensuing performance attests, though for reasons of content or simply atmosphere I’m not sure. As he presents himself in an absolute silence that seems to be a transposition of the blindness he embodies, I’m intrigued about the starkness of the world we are about to enter. The only properties are a black piano (nested with other instruments) and an all-black, hardwood bed. The man is locked in this all-black world, and the loops of sound that eventually break the silence and knot around him, familiar from Theatre Re’s previous Edinburgh hit The Little Soldiers, effectively capture a sense of being trapped with his own thoughts. Yet this blind man has a song, he is a musician, and a beautifully lyrical one at that. When he takes up his rightful place amongst the instruments and pedals, performer Alex Judd creates beautiful patterns of melody that loop and swoop around the stage. More than this though, the blind man conjures two tightly-masked figures who seem to embody his fantasies (and later fears), living out experiences he can only imagine. It’s a lovely concept but highly abstract, and it’s here that the show starts to fall down. Theatre Re have developed a detailed choreographic score for these fantasy sequences, mining different relationship dynamics and encounters between this budding couple. A railway encounter, sharing a carriage; a day out; the charged meeting of hands. Yet often it feels like scenarios remain obscure – perhaps this is a side effect of existing as shape-shifting fantasy – the actions and images remain elusive, even as it becomes clearer that there are very specific ideas from which they are drawn. More difficult, the masked characters remain as blank as their visages – there’s not enough specificity in their physical characterisation to give us something to care about and it feels like the company have underestimated the power of the mask to throw absolute focus on to the body. Beautiful and detailed choreography can’t be enough when we lack facial expressions to guide us – we are looking for much more specific clues in rhythm and reaction, and the show’s central sections become a melange of moments that are rather lovely to look at (and certainly to listen to) but generally feel hard to navigate. There are flashes of clarity, such as a waltz with the bedframe and a lovely physical metaphor for the sharing of oneself with a lover. And there are several moments which reach for magic and may become magical as the material settles in. Theatre Re are based in London and there’s a sense that they are being framed as the next generation of artists in the festival. There is certainly a boldness and promise to their vision, they just need to give more focus to the detail of their form. Billed alongside the likes of Gecko, they are in the right place to get inspired.